We understand that life altering events may require you to change your name for the better. Copy of your Pleasure Craft Operator Card (PCOC). Copy of photo I.D (Drivers licence or marriage certificate). Once you have received a reply email confirming your request has been accepted, you will then need to complete the online replacement card application with your current name, and current PCOC number. 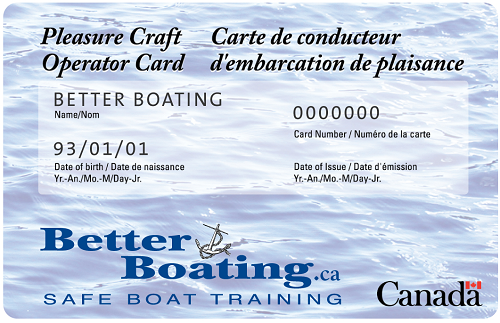 Certified cheque or money order $19.99 plus applicable taxes made payable to Better Boating Safe Boat Training® . If there is an error on your PCOC, such as incorrect spelling of your name or date of birth, you must report it to Better Boating Safe Boat Training® in writing within 30 days of issue. If reported within the 30-day period and provided that the error is not a result of Better Boating Safe Boat Training® the card will be re-issued at no charge. User errors or waiting beyond the 30 days will result in a re-issue fee. A photo copy of a government document that states your official name. A photo copy of your original PCOC. Your current complete mailing address and physical address if it is different than your mailing address. Telephone number including area code. Note: corrections cannot be made by telephone or email. A certified cheque or money order made payable to Better Boating Safe Boat Training® in the amount $19.99. plus applicable taxes. Note: that corrections cannot be made by telephone or email.